When you click the Create Group button (under the FlowJo tab or in the static toolbar) you are presented with the dialog window below. This window also appears when you double-click on a group in order to edit the criteria for membership. Give the Group a name, color, and text style. Choose whether or not to make the Group “Live” (FlowJo will examine all samples subsequently added to the Workspace and add them to a group if they match that group’s criteria) and/or “Synchronized” (FlowJo will automatically apply changes — namely gate adjustments — made in one of the samples of the group to all other samples within that group). Assign the “Role” of a group. The choices available are “Test ”, “Replicate”, “Compensation”, “Baseline”, “Gating Level”, “Controls”, and “Instrumentation”. This will help the user know the purpose of creating a particular group. 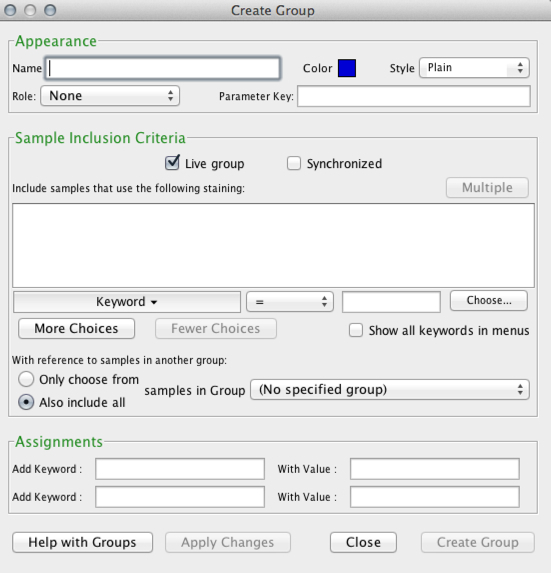 Select the sample inclusion criteria for groups. This could be a specific staining protocol introduced during acquisition or a keyword combination and could include reference samples in another group. Note: You don’t have to utilize keywords. You can also make “manual” groups in which you just manually drag and drop samples into the group within the workspace. After creating a new group, it will appear within the group panel of the workspace. If you assigned a set of keyword restrictions to the group, the samples that match the keyword restrictions will be present in the group automatically. You can also manually drag any samples into any group you’ve created. They will automatically become members of the group irrespective of the criteria you have established for the group. You may also remove samples from a group by selecting and deleting (delete or backspace key on your keyboard) them (they will not be deleted from the workspace if they are members of the All Samples group – if you want to remove a sample entirely from the workspace, you have to delete it from the All Samples group). You can reopen this dialog and change group attributes such as the name, style, and color as well as automatic sample selection criteria by double-clicking the group name in the groups panel of the Workspace Window. When selecting a group in the “group” panel note that it will appear in the “group analysis” panel, where you can easily work on it. For more details, check out Group Hints. Select a Group’s Color and Text Style: The color and style apply not only to the nodes of the group in the group list panel, but also to any node belonging to a sample (like gates) which was added to the group AND is still identical to the group’s version of the gate. This is how you can tell if a gate has been modified from the group’s version – it will not appear in the same color/style as the groups, but rather in plain, black text. Therefore, you should avoid having group nodes shown in plain, black text, as you would be unable to distinguish between gates that belong to the sample and gates which belong to the group. Live Group: If the Live Group checkbox is selected, FlowJo will examine any new data files that you add to the workspace to see if they fit the criteria for this group. If they do, then they are automatically added to the group, and any group based analyses are applied to them as well. If you are constructing template work spaces for future use, be sure that this check box is selected. Synchronize Gates: If you choose Synchronized, FlowJo will automatically update the gates for all the samples in the group as soon as one gate is adjusted in one of the samples of the group. This option saves time by applying newly adjusted gates automatically to all the samples in the corresponding group, skipping the step of dragging the newly adjusted gate into the group name. Please note, however, that it does not allow for sample variation of gates. All the gates will be the same as the last adjusted gate on any sample in the group. Stain Protocol List: FlowJo examines all data files in your workspace to build a list of the different staining panels. These are shown in the box in the middle. You can select one or more of these to state that only samples stained with the particular combination of reagents should be added to the group. Create Multiple Groups: If you select more than one stain(s) as a criteria for the creation of a group, the Multiple button will become available and selecting it will make a separate group for each selected reagent panel. More Choices/Fewer Choices: This allows you to manage the keywords which denote groups. You can specify one or more search criteria based on FCS keyword values. Select an FCS keyword, a comparison, and the value to compare against; FlowJo will add samples to the group only if they meet the search criteria. Create a Subgroup: You can specify that a group is composed of only samples from another group (or to use all samples in another group), essentially providing you with the ability to make subgroups. Samples must fit all criteria specified in this window in order to be added to the group.